Russia vetoed a United Nations Security Council resolution that would have condemned the use of chemical weapons in Syria last week and called on the government there to cooperate with an investigation into the incident. Russia, a permanent member of 15-nation Council, exercised the veto on Wednesday when a draft resolution drafted by France, the United Kingdom and the United States was tabled at the UN. While 10 of the Council’s 15 members voted in favour, Russia rejected the text, as permanent member China, as well as non-permanent members Ethiopia and Kazakhstan abstained. “...With its veto, Russia said no to accountability. Russia said no to cooperation with the UN’s independent investigation. And Russia said no to a resolution that would have helped promote peace in Syria,” US Ambassador to the UN Nikki Haley said after the resolution was failed to be adopted. “Russia once again has chosen to side with Assad even as the rest of the world -- including the Arab world -- overwhelmingly comes together to condemn this murderous regime,” she said. Shortly after Russia exercised its veto, US President Donald Trump told allies that it was time to end Syria's ‘brutal’ civil war, as he branded Assad a ‘butcher’ and questioned Russia’s role in the chemical attack. Trump said that America's relationship with Russia ‘may be at an all-time low’, but he hoped that it would have been wonderful if the two countries could get along. “It would be wonderful as we were discussing just a little while ago, if NATO and our country could get along with Russia. Right now we’re not getting along with Russia at all. We may be at an all-time low in terms of relationship with Russia,” Trump told reporters at a joint White House news conference with the North Atlantic Treaty Organisation Secretary General Jens Stoltenberg. "This has built for a long period of time. But we’re going to see what happens. Putin is the leader of Russia. Russia is a strong country. We’re a very, very strong country. We’re going to see how that all works out,” Trump said. Secretary of State Rex Tillerson has just concluded his maiden visit to Russia during which he met Putin. “I’ll be speaking in with Rex Tillerson in a little while, calling in. I think he had a very successful meeting in Russia. We’ll see. We’ll see the end result, which will be in a long period of time perhaps. But the end result is what’s most important, not just talk. And I think that based on everything I’m hearing, things went pretty well, maybe better than anticipated,” Trump said. Trump hoped that the European countries would have nothing to fear from Russia. He called on NATO allies to ‘work together to resolve the disaster’ in Syria and thanked them for condemning Assad’s suspected sarin attack. “Vicious slaughter of innocent civilians with chemical weapons including the barbaric killing of small and helpless children and babies must be forcefully rejected by any nation that values human life,” Trump told reporters. “That’s a butcher. That’s a butcher. So I felt we had to do something about it. I have absolutely no doubt we did the right thing, and it was very, very successfully done,” he added. “It is time to end this brutal civil war, defeat terrorists and allow refugees to return home,” he said. Trump said it was ‘certainly possible’ that Putin knew about the attack, blamed on Assad, indicating Russian officials were present at the source airbase, which Trump later bombed. “I would like to think that they didn't know, but certainly they could have. They were there. So we’ll find out,” he said. Trump also praised China for abstaining during the UN vote. This was the eighth time during Syria’s six-year-old civil war that Moscow used its veto power to block a resolution against Assad’s government. The resolution would have strongly condemned ‘the reported use of chemical weapons in the [Syria], in particular the attack on Khan Shaykhun’, the site of last week’s incident that has drawn increasing global attention. 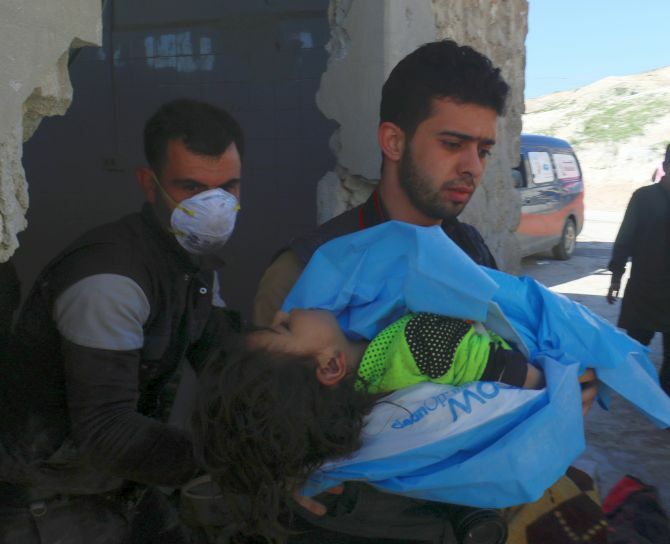 The measure would also have called on the Syrian government to comply with relevant recommendations of the Organisation for the Prohibition of Chemical Weapon’s Fact Finding Mission and the OPCW-UN Joint Investigative Mechanism. Before the vote, Russia’s deputy UN envoy Vladimir Safronkov said in the course of negotiations between his country’s Foreign Minister Sergey Lavrov and US Secretary of State Rex Tillerson, Moscow had suggested a joint communication asking the OPCW Director-General to immediately put together an international mission to visit Khan Shaykhun and the Shayrat airbase. The US Secretary of State was considering that proposal, he said, adding that the whole gamut of issues would be discussed by OPCW on April 13 at The Hague. Putting the draft to a vote a day before that would serve no useful purpose, he emphasised. He said Russia voted against the draft because of its ‘erroneous’ contents, emphasising that his country’s concerns and priorities had been pushed aside. The main problem was that the ‘troika’ of drafters had named a perpetrator before a proper investigation had been conducted, he said, adding that by presenting a ‘doomed’ resolution they had undermined the Council’s unity. “I’m amazed that this was the conclusion. No one has yet visited the site of the crime. How do you know that?” he said. He said the US attack on the Syrian air base ‘was carried out in violation of international norms’. He added that some states had expressed an anti-regime slant and a reluctance to ensure a truly impartial investigation, he said, cautioning that other incidents, involving extremists, could unfold. Haley said the UN Joint Investigative Mechanism and the Organisation for the Prohibition of Chemical Weapons have told it many times that Assad will not provide access to investigate. “Russia said this resolution was biased and that the Assad regime was not involved. This resolution simply emphasised the information the regime is already required to provide to investigators,” she said. “Today’s vote could have been a turning point. Once more, this vote could have been the moment when Russia saw that its interests do not lie with a murderous dictator, but rather with the many countries in the international community, including those across the Middle East, that want to end this conflict. By its failure, Russia will continue to be isolated,” she added. UK’s Permanent Representative Matthew Rycroft Russia vetoed the resolution that would have supported a swift and independent investigation into the Syrian chemical weapons attack. “We’ve once again encountered a Russian veto, the eighth time that Russia has used its veto to protect the Syrian regime. This one is even more regrettable given that Russia was the architect of the 2013 agreement to dismantle Syria’s chemical weapons programme, an initiative that has demonstrably failed,” Rycroft said. “It is indefensible that Russia has chosen to protect the perpetrators of these attacks rather than work with the rest of the international community to condemn them,” he added. In February, Russia and China vetoed a measure that would have imposed sanctions on a number of individuals and entities linked to the use of chemical weapons in cases where responsibility was established by the OPCW-UN Joint Investigative Mechanism. Did Assad launch the gas attack against his people?